Notch searches for Colonel Kooze to prove his innocence and must also find a way to stop Kimberlee's wedding to Harry. Notch sneaks into a peace meeting between China and Africa at Malibu Adjacent to stop Captain Enteneille from an assassination attempt. Also, Jamaica falls for, and gets engaged to, an African prince. Notch Johnson: How come I can't see your reflection in this mirror? Oh, I see..."Made in Taiwan". If you were a fan of the "Police Squad" tv series and movies and of the 1960s tv show "Get Smart" and enjoy seeing gorgeous bikini-clad women then this is the show for you. The first product from Howard Stern Productions is downright hilarious. 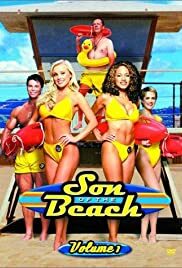 Even the character names are significant: "BJ" (received her nickname from her high school football team), Mayor "Massingale", (as in douche), the mayor's oh-so-gay adolescent son "Cody" (in honor of Cody Lee Gifford), and muscular German-exchange lifeguard "Chip Rommel" (I guess they couldn't call him Chip Hitler or Chip Goerring or Chip Eichmann). As Stern himself describes it, this show is "cleverly stupid". This show is one that must be taped and watched with remote control in hand, because the dialogue's humor is often very subtle. This show is very, very funny. And real easy on the eyes too.